Find us on the premises of St Marks Church, 250 George Street, Fitzroy. The Dance of Life is a long established yoga school and healing centre in the heart of Fitzroy, just north of Melbourne’s CBD. We are committed to spiritual, emotional and physical health, happiness and peace of mind. Our philosophy is simply to open the mind and heart to the Infinite in each and everyone. Yoga and dance classes for all levels of experience from beginner to advanced are held 7 days/week. We also offer mums and bubs classes and pregnancy/ prenatal yoga instruction. Click here for our timetable and more information about the teachers at Dance of Life. Practitioners from diverse backgrounds such as shiatsu, massage, arts therapy, kinesiology, dance movement therapy, body mind centering come together under one roof to work holistically towards your health. Contact Nina if you’re interested in attending, or if you have specific workshop topics you’d like see addressed. You can find and join the Facebook group here. Attention! Workshops now held on Sundays! May 5th we’ll be looking more closely at Surya Namaskar, sun salutations, or what is also understood as ‘vinyasa’. What is the background to these movement patterns, how to execute them correctly, how to transition, breathe and amend, are just a few of the questions we will be addressing in this workshop. 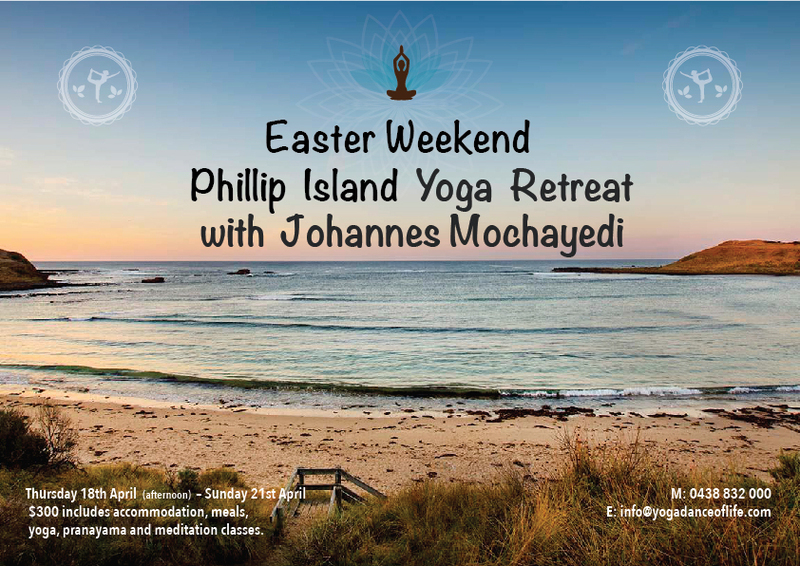 All levels welcome, whether you are new to the practice or a seasoned yogi who wants to revisit some ‘basics’. Contact Nina for details, to register and pay. Feel free to join the Facebook event. Where: Private sessions for people at the DOL studio and from his home in West Heidelberg. Most of our current health problems are caused by stress and wrong lifestyle or attitudinal habits. 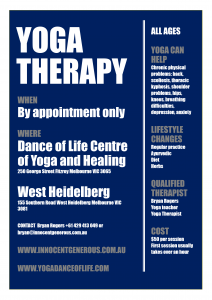 Yoga Therapy endeavours to get to the root of these issues by relaxation, breath work, simple structured exercises, herbs, diet, meditation, sound and lifestyle changes that you can implement for yourself with help from Bryan. Yoga Therapy can help with physical problems associated with the back, shoulders, neck, hips and knees. It is also useful in depression and anxiety. Wednesdays, Thursdays and Fridays are double dip days!